Landowners from the six mine area villages which host the Ok Tedi Mine Project operated by Ok Tedi Mining Limited (OTML) have become the first ever landowners to own a larger than mandated equity share in any resource project in Papua New Guinea. In an historic benefit sharing agreement (BSA) signing in Alotau on the weekend, the six mine area villages and the 152 villages from the Community Mine Continuation Agreement (CMCA) regions will see them sharing in the 33 percent direct equity interest in OTML which the O’Neil-Dion Government approved in 2014. The other parties to the Agreement are the State and the Fly River Provincial Government who will sign at a later date. The parties present at the signing on Saturday 21st January 2017 included Chief Secretary to Government, Isaac Lupari, the Core Group Leaders and delegate representatives from the mine area villages, from the CMCA regions, Mineral Resource Development Company (MRDC), and Mineral Resource Star Mountain (MRSM), Mineral Resources Ok Tedi No. 2, Ok Tedi Mining Limited (OTML), and the State representative from Mineral Resources Authority (MRA). 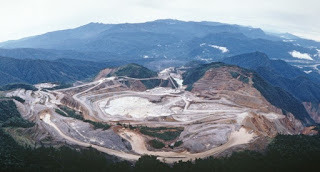 The National Government has recognized the suffering but more importantly the patience of the people of Western Province in allowing OTML to support the country since 1973 and even after Bougainville Copper Limited (BCL) closed due to the crisis, and therefore is giving the landowners in Ok Tedi, the CMCA Regions and the Provincial Government free direct equity in the Ok Tedi Mine. The National Executive Council (NEC) decision relating to the granting of the free equity were made in 2014. The benefit sharing Memorandum of Agreement (MoA) took over two years of negotiation amongst landowners, the Fly River Provincial Government and the State and the signing on the weekend between the respective parties is a great news for the people. Representatives of Women and children’s groups also participated in the entire process and were represented at the signing. The share distribution of the 33% equity will see CMCA group owning 12 percent, the Mine Area Villages will own 9 percent whilst the Fly River Provincial Government (FRPG) will own 12 per cent of which, part of its interest will be shared with three districts (North Fly, Middle Fly and South Fly). The percentage breakup was agreed upon by all parties through a Share Distribution Agreement in July 2015. “Now you’ve got one third direct participation. It is for the first time in the history of this country and it’s a big decision the Government has made for the Landowners to have direct participation from OTML,” said Chief Secretary to the Government, Isaac Lupari. The MOA sets out details of how benefits from the equity interests will be distributed and applied. According to the MoA signed 40 percent of the benefits from the respective shares will be paid in cash to landowners while the other 40 percent will go towards investment purposes and 20 percent will go towards infrastructure development programs and projects.